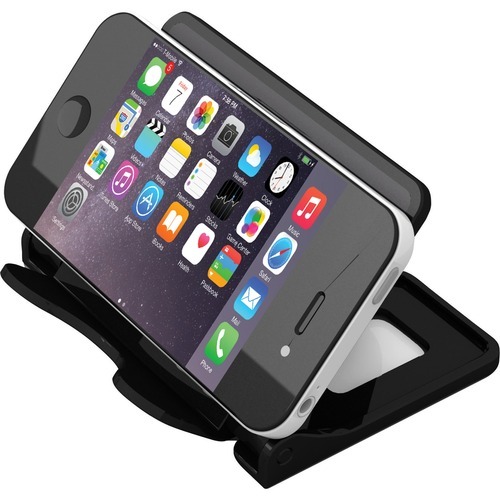 Deflect-o Hands-Free Phone Stand - 2.8" x 4" x 2.8" - 1 Each - Black - Welcome to The Office City! Portable, hands-free device stand features a pliable, nonslip gripper surface that holds your smartphone in place. Adjustable viewing angle reduces screen glare. Protective rubber feet limit movement and protect tabletop surface. Portable, hands-free device stand features a pliable, nonslip gripper surface that holds your smartphone in place. Adjustable viewing angle reduces screen glare. Protective rubber feet limit movement and protect tabletop surface. Compact, fold-and-go design is perfect for travelers.